At Whole Foods. Hemp: it’s the new soy. 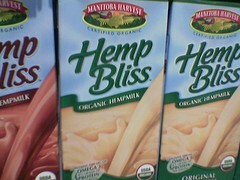 Seriously, hemp milk? Previously: hemp brownies. All non-THC, sadly.